You want more than just a dashboard to display in the office? You want to gather all your marketing data sources in an all-in-one dashboard software? You need to send reports to your clients automatically, in their preferred format, every month? In other words, you want a tool created specifically for your needs as a marketing agency? No problem! With DashThis, everything is automated and easily customizable for all your clients. No need for an IT or a business intelligence specialist, all you have to do is plug-in your marketing platforms to display your preferred KPIs. It’s as easy as 1-2-3. Why is DashThis the Geckoboard alternative you need? Geckoboard is a great business intelligence software if you want to showcase your business data in a conference room. DashThis, on the other hand, is a tool specifically built to enable agencies and marketers to create perfect reports for their clients. 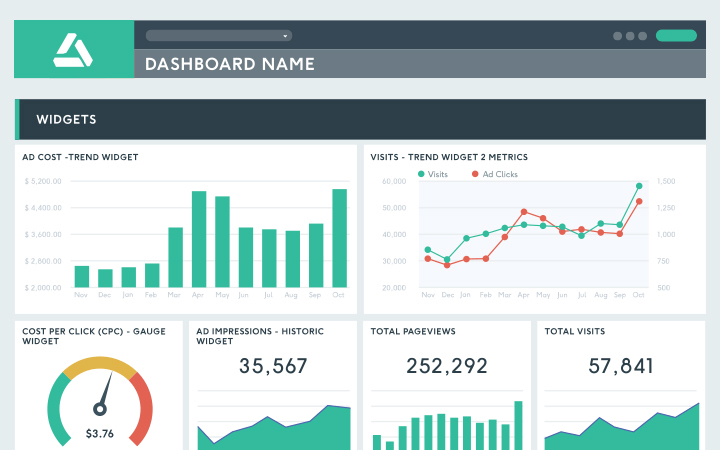 DashThis isn't just a dashboard builder, it's also an easy reporting tool. Automate your reporting process in seconds and get an awesome report that you can easily share with your clients! Bring all your ecommerce, email marketing, social media, or web analytics data into an all-in-one automated report. No IT required; select your graph type, the KPI you want to display, and tada! You’re all done. Want to move them around? Sure, simply use our drag-and-drop feature. Want it to be even faster? Either use our preset report templates and get an pre-made report that you can customize to your needs, or clone your reports in the click of a button! Of course, you can share your dashboard with a URL. But that’s not all; you can also export them as PDFs if your clients prefer their reports that way, you can print them, or even better, set up an automated email dispatch. That way, your clients can consult their reports in real-time, at the frequency you choose: daily, weekly, monthly, quarterly, yearly... It’s up to you! No matter the plan you choose, you get your own dedicated account manager, ready to answer all your questions and help you create splendid reports! Need a personalized demo? You got it! Want some advice on the best way to report your SEO? Sure! We got your back no matter what! We’re even renowned for our exemplary, personalized support! Unlimited users in your account, unlimited access to your own dedicated account manager, as many widgets as you need, all the features... No matter the plan, you get everything; no extra fees, no worries! Ready to try an epic Geckoboard alternative? DashThis has all the features you’ve been looking for! No IT or business intelligence expert needed. Use our user-friendly drag-and-drop feature and create a report exactly how you want it, or try our preset widgets and report templates to make it that much easier. All DashThis plans come with unlimited users, and it won’t cost you a single penny more! All your team members can have easy access to your data visualization software and collaborate in real-time. Our reports are good-looking and customizable from the get-go! You can add your logo, custom data, KPIs, notes, comments, and images very easily. You can even change the layout in a matter of seconds. You can combine all your data sources, accounts, or pages, and it’s as easy as can be. All our 30+ marketing integrations can be added with just a few clicks. You can even add your own proprietary data from an Excel or Google sheets spreadsheet with our CSV file manager! No programming, no third party systems, no problem. Replace the report’s URL by one that’s branded to your company: reports.yourcompany.com sounds great! Take a seat and relax while our team of creative designers work their magic to reflect your brand’s colours, fonts, and overall vibe. Why not both? Get a discount by choosing both the custom URL and design. With DashThis, you can easily get a social media report with multiple data sources and platforms like LinkedIn, Facebook, Twitter, and Instagram. You can either create separate reports for each or gather them all into one KPI dashboard. So easy! Want a Google Analytics report to track your web analytics data too? You got it! Whatever you need: business dashboards, data analytics reports, or any marketing reports, we built a marketer-friendly, easy-to-use data visualization tool for all your marketing needs. Take a look at our 30+ built-in integrations. DashThis is the perfect Geckoboard alternative because it's a reporting tool for agencies’ marketing reports rather than complicated data analysis software. Our dashboard software is easy to use, good-looking, and on top of that, we have an incredible support team to help you. No matter the plan, our analytics platform delivers the best reports out there! But don't just take our word for it! See what our clients had to say!